Welcome to Lisa.B.Designs : Introducing A New Design Team Member! Good morning, thanks for visiting the Lisa B Designs blog today. Kirsten here with a very special announcement. On Lisa's behalf, I am delighted to welcome a new design team member. 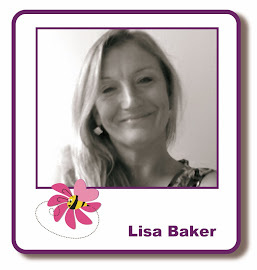 "Hello, I feel very privileged to have been asked to help on the Lisa B Design Team. A little about me.......... 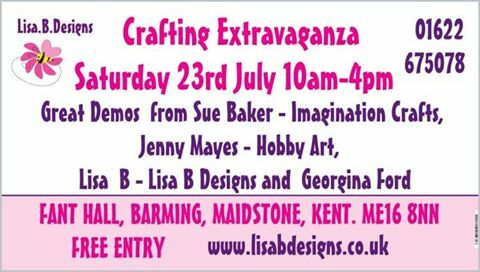 I live in Maidstone with my husband and my son (who has also developed the crafting bug!). I come from a background of creative people, with my dad a trained carpenter and keen gardener, my mum an exceptional knitter and good crochet maker, my sister who excelled at Art an school and is really good at drawing and painting, (plus any other craft thing she turns her hand to), so it's in my blood. I loved stationery and pretty papers as a child and used to do paper swaps back then, not realising I was starting my first paper stash! I love colour and coordinating items and I have studied interior design. I have been making cards for the past 15 years or so and have loved the journey. My first cards were basic, but my selection of materials was limited along with my knowledge but that didn't stop me experimenting. These first cards show me how far I've developed as a crafter and what I've learnt on this continuing, addictive, journey. I like stamping but I also enjoy experimenting with new products or techniques to add variety to my cards. Inspiration for projects can come from all sorts of sources, from the garden to 'oh that would be good as.....' and the creativeness then starts. I hope you like my future makes and if you have any questions please feel free to ask me." Thank you, Julie! It is great to have you here. Here is my first post for the Lisa B DT, I hope you like it. The topic is rice papers as we used them at the last class. These papers are very versatile and I have enjoyed working with them to design my cards. My first card features Imagination Crafts rice paper, Starlights paints & a Card-io Collection's stamp. I'm not normally instantly drawn to butterflies but the colours in this paper just caught my eye and I kept going back to it, hence this became my first project. I cut a square of white super smooth card to 160mm/160mm square and a piece of black card to 165mm/165mm square. I then used the spatula to decant the Imagination Crafts Starlights paints - Passion Flower, Silver Gold and Apple Green - onto my non stick mat. I mixed the paints with the brayer and then applied them to the white card, put it aside and left it to dry. Card-io Combinations Say It With Flowers set with Onyx Black Versafine and heat embossed using WOW! Clear Gloss embossing powder. Then I moved onto the gorgeous rice paper overlaying it onto my card to see which area fitted best and wouldn't cover the sentiment I'd just stamped. With my area of rice paper selected I used a non stick mat and a wet paintbrush to outline my chosen area, I found I used my finger on one hand to hold down the rice paper whilst the other hand was gently teasing the rice paper to get the best tear. Once I'd got the area of rice paper I wanted I set this aside to dry. I used a Pink Lobster Promarker from my stash to do faux stitches around the edge of the card to complement the pink dots in the rice paper, making sure I didn't edge the rice paper. Finally, I added Ranger Glossy Accents (a particular favourite of mine) to highlight the black and yellow butterfly and pull the project together. Well, this ends my first post, I hope you like it as much as I enjoyed making it. Have a good day and see you next week. Your card is beautiful, brilliant use of the rice papers and especially the Starlights background I love it. Look forward to your next project. beautiful card...thank you for explaining your techniques so clearly.Love the starlight background and those beautiful butterflies.Can't wait to see more from you! !